Hundreds of SUP and prone paddleboarders from around the world to compete in 32-mile open ocean race. Website features new race art and new downloadable commemorative video. The race is expected to sell out well before the deadline on July 1. 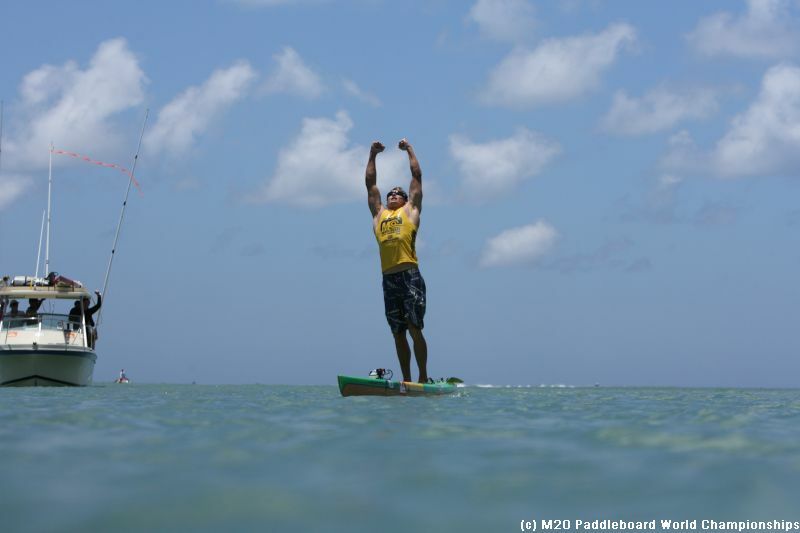 Organizers of the 16th annual Molokai-2-Oahu Paddleboard World Championships (M2O), presented by Kona Longboard Island Lager, today opened online registration on the event’s redesigned website at http://www.molokai2oahu.com. The announcement officially kicks off the countdown to race day on Sunday, July 29, 2012. 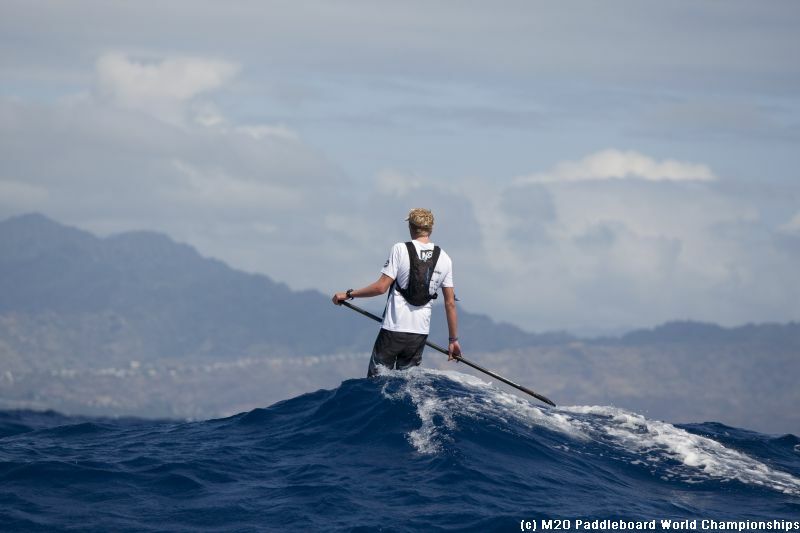 Prone and Stand Up Paddleboarders (SUP) from 15 countries will compete in this year’s 32-mile race across the infamous Ka’iwi Channel between the islands of Molokai and Oahu. The event is expected to sell out well before the deadline on July 1. Athletes are encouraged to register early to secure a position at the start line. Men and women can register as solo competitors or on teams of two and three. Stock and unlimited boards are welcome in the solo and three-person team races. Only stock boards may be used in the two-person team competition. Entry fee includes official M2O championship T-shirt, race jersey and dinner at the famous Outrigger Canoe Club as part of the post-race award ceremony. The pre-race expo and mandatory packet pick-up will be hosted at Dukes Waikiki on July 26. 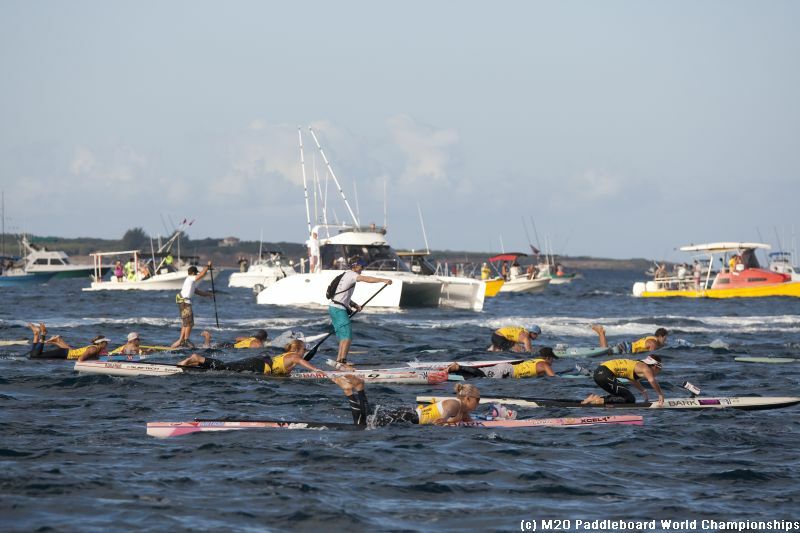 M2O event organizers are also excited to announce a distribution partnership with The Surf Network for the official 2010 and 2011 Molokai-2-Oahu Paddleboard World Championship highlight video. The Surf Network delivers an extensive collection of premium surf video content on numerous platforms to viewers worldwide. Featured now on the M2O website is a sneak peak at the new 2012 race art created by artist Matt Beard of Eureka California, as well as the first of a series of monthly videos produced by Soul Surf Media to get racers fired up for the upcoming challenge. Also featured is a growing media gallery of race images. As additional features are added to the M2O website leading up to race day, competitors and paddleboard fans can receive updates on the official Facebook page and through Twitter. Founded in 1997, the Molokai-2-Oahu Paddleboard World Championships, presented by Kona Longboard Island Lager, is set to celebrate its 16th anniversary on Sunday, July 29, 2012. The annual race has grown from a grassroots challenge for the legendary lifeguards and watermen of Oahu to the premiere event for the sport of paddleboarding. More than 250 courageous men and women from 15 countries will attempt to cross 32 miles of treacherous open ocean known as the Ka’iwi (kah-EE-vee) Channel from Kaluakoi Beach on the north shore of Molokai to Maunalua Bay on the south shore of Oahu. The fastest athletes complete the crossing in less than five hours, facing powerful currents as they surf atop swells that can reach heights of more than 12 feet and carry athletes for hundreds of yards. The organizers and athletes of the Molokai-2-Oahu Paddleboard World Championship, presented by Kona Longboard Island Lager, thank the event’s valued partners for making the annual race possible (alphabetically): Dukes, Garmin, Hawaii Tourism Authority, Kona Longboard Island Lager, Maui Jim, Rogue SUP, Teva and Watermans Applied Science. Jamie Mitchell wins 10th consecutive world championship in 2011. 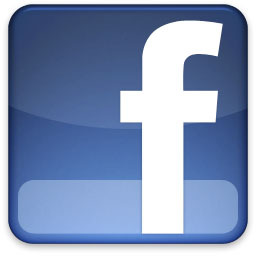 Find Molokai-2-Oahu on Facebook. 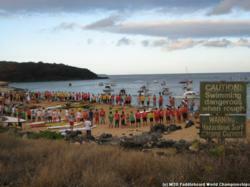 Prone paddlers start 32-mile race across Ka'iwi Channel SUP paddlers surf swell in middle of Ka'iwi Channel. Island of Oahu in background.